Credit Crisis Collapse What Happens Next? Letters of Credit: Going, Going Gone? What to Do and Where Do We Go from Here? I have been writing for almost a year that the next shoe to drop on US banks would be commercial construction lending. Today we look at some hard numbers. We look across the pond to sort out the problems in Europe. We look at the consequences of the losses stemming from Lehman. Then we look at one of the more serious consequences of the banking crisis, one that will bring the crisis home to you. Finally, we look at what the various governments of the world must do in response. It may not be fun, but it should be interesting. And it is important. Feel free to forward this letter to anyone who asks why we not only need the bailout but will need even more coordinated government action. But first, let me offer a note of optimism before I serve up the not so good news. This is not the end of the world. There are a lot of very positive things happening in the US and the world. Companies are creating new inventions. Much of the economy, including health care, is moving along fine. I have lived through two serious recessions (1973-74 and 1980-82), and the point is that a free-market economy will find a way to eventually get back to solid growth. Recessions are simply part of the business cycle. Congress cannot repeal the business cycle. This will not be the last recession of my life. I hope to live long enough to go through 4 or 5 more. Depressions are caused by governments making major policy mistakes. And we have made some in the areas of not regulating mortgage lending, allowing the five large investment banks to increase their leverage to 30 or 40 to one in 2004 (what was the SEC thinking? ), and failing to oversee the rating agencies. That is behind us. It will make a normal recession deeper and the recovery longer, as I have been forecasting for some time. But as I argue below, immediate actions must be taken by the government to avoid a much deeper problem. To not take actions to stem the credit crisis would be that major policy mistake which would compound all the other mistakes. I think everyone knows the seriousness of the problem and will act. Let's pray they do. But whatever happens, there will be plenty of opportunity for investors and entrepreneurs to exploit. The world is on the cusp of a remarkable explosion of new technology of all sorts that will transform our lives. This march of progress went on unchecked last century, through two world wars, major depressions, numerous smaller wars, recessions, financial crises all over the world, famines and natural disasters, not to mention a lot of man-made ones. The current crisis will pass. None of us will want to go back to the "good old days" in 20 years, for we will be living in the best of times. Just make sure you keep your powder dry so that you can enjoy it. And now, let's look at some less than uplifting news. The Bank Credit Analyst is one of the more reliable sources I know for information. They estimate that total losses from the current debt crisis could be anywhere from $1.1 trillion to $1.7 trillion. They estimate roughly half to be in the banking sector, or around $750 billion, and almost $590 billion of that has already been written off. That means that the $700 billion from the TARP (government bailout) program may actually be enough to handle the losses and inject some actual capital into the banks. Maybe. The losses from subprime and other mortgage-related loans are well known. Most of those losses are in the larger banks, as smaller banks simply could not participate to any great extent. What is less well understood are the potential losses which smaller banks are in fact exposed to in the area of construction lending. Lisa Marquis Jackson, now writing for John Burns Real Estate Consulting (one of the best sources for hard real estate data), gives us some answers to the question of "how much?" Outside of the large home builders and developers, most of the lending for construction of homes and commercial property comes from regional and local banks. A local home builder may finance 5-10 homes, or a developer a small strip mall or apartment complex, from their local bank. Look at the graph below. Since 2001, delinquencies had been rather small and well-contained. Then starting 18 months ago, the delinquency rates started rising. Again, note that these are delinquency rates for business loans from banks and not for individual mortgages. Over 16% of loans made for condominium construction are now delinquent. Loans made for single-family home construction are only slightly more than 12% overdue. But that masks a much bigger problem. 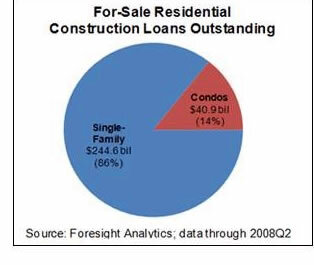 Single-family loans account for 86% of all for-sale residential construction loans outstanding. The good news is that for the top 100 banks by size, single-family loans make up only 2% of the total. But that small portion totals $245 billion. And condos add another $41 billion. That puts almost $40 billion at risk of default at today's delinquency levels. It will be worse for many smaller banks, as they have larger commercial construction loan portfolios. As noted below, this may require some proactive action on the part of regulators. Now we know the consequences of allowing Lehman to fail. The severity of the credit crisis was deeply, severely worsened by the failure of Lehman. Based on the results of the credit auction today, sellers of protection will need to make cash payments of more than $270 billion, BNP Paribas SA strategist Andrea Cicione said in London. Some funds may be forced to dump assets to meet the payment demands if they haven't hedged. How much of that debt will eventually have to be absorbed by various government programs or direct capital infusions? It is too soon to say, but you can bet it will be a lot. If there is any good news to this, it is that much of the write-downs have already been made. It now looks like the Lehman CDS market sorted itself out with no failures, according to the International Swaps and Derivatives Association. We have dodged a huge bullet. But the anguish this has put the credit markets through the past month was avoidable. The CDS markets MUST be made to migrate to a regulated clearing entity like the Chicago Mercantile Exchange. Next week would be a good time. While there have been serious losses by various players in other exchange-traded markets, there was no systemic risk, as everyone knew the value of their various securities, whether futures or options or other derivatives, and knew they would get their full value when sold. With Lehman, no one really knew until late today. Thus banks and hedge funds had to sell anything they could in order to meet possible payments or losses, which caused wildly swinging prices in every market. It is my bet that future memoirs of the various main actors and books on the credit crisis will look back at the failure of Lehman as the proverbial "last straw" for the unregulated CDS markets. Let's get this straight. Iceland is a country of 300,000 people. I've never met an Icelander I didn't like. They are an extraordinary people. A few decades ago, they made their money on fishing, farming, and trading. Then they discovered banking and started to take deposits from anywhere and everywhere and make loans outside the country. Soon, the various banks' assets were over $140 billion, about 10 times the total GDP of the country, and they had far more foreign depositors than citizens. With foreign reserves of just 2 billion euros, what could the government do if there was a crisis? Now Iceland has had to take over the banks and guarantee deposits. They also had to turn to Russia for a loan. Does anyone think Putin would hand out a no-strings-attached loan? Russia needs a refueling station for its Navy and will likely get it. Note that Iceland gave its citizens the ability to withdraw money but did not extend that same privilege to the citizens of other countries. England and the Netherlands have already gone to court. "Thus, not only are banks fearful of lending money to banks; and not only are banks fearful of lending money to individuals and/or companies; and not only are individuals and/or companies fearful of lending money to the banks, but now nations are fearful of lending to other nations. This is Smoot-Hawley writ large, and of all of the circumstances that have prevailed in the course of the past several days, this is the worst; this is the most difficult to deal with. This is madness." As noted last week, Ireland set off a feeding frenzy when it guaranteed all deposits in its banking institutions. Five billion euros poured in over the last week. One by one, European governments are having to guarantee their loans to keep money from leaving their institutions. Let's look at the Irish guarantee on the face of it. There are six Irish banks, holding assets of $576 billion. That works out to three times Ireland's gross domestic product, or about $200,000 for every working person in the country. (Bedlam Asset Management) Yet depositors flooded them with money in just a few days. This is a sign of panic. One goes where one can, trying to protect what one has. On the face of it, how could Ireland really guarantee all the deposits? Yes, there are real assets against the loans, but at what price? Could Ireland borrow enough to make good on even a portion of those assets, should they decide to walk? This is sheer panic. Just as the business world is dependent upon commercial paper as its life blood, the world of global trade depends on letters of credit (LOC). Without LOCs, the world of trade quickly freezes up. If you are a manufacturer of a product and want to sell to someone outside your borders, you typically require a letter of credit from the buyer before you load any cargo at a port. A letter of credit from a prime bank is considered to be proof of your ability to pay. It not only can be a source of ultimate payment, it can be a source of inventory financing while goods are in transit. And if you are a business which is buying a product, you do not want to release money until you know the product is on the way. There are buyer's and seller's agents who make sure these things happen seamlessly, and world commerce had grown because of it. Now we are starting to get anecdotal evidence that this extremely vital market is also freezing up. If you think the problems stemming from a meltdown with the commercial paper markets are threatening to the world economy, they are small potatoes when compared to a seizure in the letter of credit markets. "At the end of the day, if every counterparty is bad then you don't have a market and you don't have an economy. I spoke to another friend of mine this afternoon, whose father has been in the shipping business forever. Pristine credit rating, rock solid balance sheet. He says if he takes his BNP Paribas letter of credit to Citi today for short term funding for his vessels, they won't give it to him. That means he can't ship goods, which means that within the next 2 weeks, physical shortages of commodities begin to show up. THE CENTRAL BANKS CAN'T LET THAT HAPPEN OR WE HAVE NO ECONOMY, LET ALONE A CREDIT SYSTEM." If banks are refusing to go into the LIBOR market and lend to each other, then why would they want to take a letter of credit either? At first, it will be a small trickle, which is how the commercial paper meltdown started. Then it will be a flood. The one good sector in the US is its export sector. Start slowing that down due to a lack of ability to ship or receive payments and see what happens to an already shrinking economy. If anyone wants to see how the credit crisis can affect Main Street, look no further. It is hard to overstate the problem and the potential for it to create a true economic meltdown. It must be dealt with, and soon. See more below. The credit markets are frozen. Period. The chart below shows one week LIBOR going back for four years. Notice the gradual rise into 2005? It was a lock-step move with the Fed funds rate. And the less smooth drop was also in concert with the Fed funds rate. The recent spike is not responding to this week's Fed funds cut. The spreads are wider than ever. The problem is not just the price of LIBOR. There is no trading at any price. The LIBOR market is a fiction today. And left unchecked, this lack of dealing with other banks will spread to letters of credit and the international trade markets. The G-7 group of nations is holding an emergency meeting this weekend. As I write this, reports are coming in that there are serious disagreements as to what to do. They cannot even agree on a press release. Former Federal Reserve Chairman Paul Volcker urged that "all of them [the G-7 nations] now admit or all of them own up to the fact their own banks are going to need support," in an interview on PBS Television's Charlie Rose Show yesterday. Sadly, he is right. It has come to that. We are close to the point of no return. Now, we are not talking about bailing out financial institutions. We are literally talking about saving the world economic system. Failed bank lending and a large decrease in letters of credit would guarantee a deep world recession. The last depression produced severe political backlash and a world war. Frankly, it is simply not worth the risk to say that we should sit back and let the markets work. They are not working, and there are no signs they will. As with a patient whose heart has stopped, it is time to apply the shock treatment. What should we do? We must simply guarantee LIBOR (interbank) lending worldwide for some period of time (say 3-6 months) or until banks can trust each other's balance sheets. With the Lehman crisis going on, with more mortgage credit problems being revealed, no one knows what their own exposure is, let alone what the exposures of other banks are. Until that dust settles, the LIBOR market will remain frozen. The longer this is allowed to continue, the worse the problems will be. And it needs to be handled on a coordinated basis. Banking is truly global. The system cannot just be guaranteed by England or the US. It must be done in concert with all major nations contributing their share. Businesses must be able to trade across borders through banks that will accept one another's letters of credit. Second, we must consider direct investment in some banks. This should be done as preferred shares, with the view to eventually selling the paper back into the market. To make sure that money is not invested poorly or on bad terms, the various governments should invest alongside private investors, on the same terms. If a bank cannot find private investors willing to invest alongside the government, then they should be quietly assisted into the arms of stronger banks. Banks that are too big to fail must be taken over. Businesses must have access to credit as well. They cannot get it from banks with impaired balance sheets. This is critical to world trade as well as local commerce. Third, for a short period of time, all bank deposits in the US must be guaranteed. Weak banks must be absorbed into stronger banks as soon as possible. There are banks with large construction loan books in the hardest-hit parts of the US housing crisis, and they need to be put down as quickly as possible. We are already seeing deposits leave banks, many of them small, due to depositor concerns that small banks will not be seen as too big to fail. This must stop. A blanket guarantee will help. Fourth, mark-to-market rules must be reconsidered. A blanket one-size-fits-all rule clearly does not work and is part of the problem. As I have documented for the last month, there are numerous assets that have a market price far below their intrinsic value. That is because there are simply no buyers. If everyone is selling in order to raise capital, then that will drive down prices to bargain levels below intrinsic value. That does not mean the asset in question would not have a higher value in a market not in crisis. These are extraordinary times. I know there will be those who believe the markets should be allowed to work or simply want those who created the crisis to pay. I do understand the anger. I too am angry, and have been for a long time. Those of us who saw this crisis coming are frustrated that no one bothered to pay attention. But now that we are in it the midst of the crisis, there is no going back. We must look forward and do what we can to avoid an even worse crisis and potential depression. I believe we can do so if governments act promptly. We are already in what will prove to be one of the longer recessions on record. If we look at the Leading Economic Indicators, which have about a 9-month forward-looking view, it will be late next year before we start to grow once again. Given that everything peaked last October through January (sales, employment, etc. ), it is likely that the recession will be dated from the beginning of this year. Long-time readers know I have been wary of the stock market for several years, suggesting that investors either avoid stocks or have close stop losses. No one taking my advice is long-only this market. Not that I have been perfect, but as it turns out, I was right on this one. I have been fielding calls all week asking me if I think we are close to a bottom in the stock market. And my answer is, we are close to a short-term bottom, but I think we will trade lower over time due to what I think are going to be poor earnings for the next few quarters. If you are a trader (and that means you have been doing it for some time - not the time to get on the job training! ), then maybe you can catch a rebound, which is overdue. But (and here is the big caveat) if there is no global coordination on some or all of the recommendations I made above, this is not going to be pretty. It will end in tears. Let's hope the authorities can get their collective act together. The next two weeks I'll send a two-part letter on the longer-term investment view and how you should position your portfolios. Stay tuned. Next Thursday and Friday I am in Southern California, speaking at two financial planning conferences. Saturday I leave for London to meet with my London partners, Absolute Return Partners, and clients. Then on to Stockholm, where I will speak for the now-Swedish-government-backed bank Kaupthing. The government took the bank over last Monday (it was affiliated with the Icelandic bank of the same name). That conference will be on investing in an age of scarcity. I will be speaking and chairing the panels, and good friend Marc Faber will be there as well. It will be an interesting time to be in London and Europe. A quick trip to Malta, and then I will make my way back to Dallas. Tomorrow night all seven of my kids and family will gather to celebrate my son Chad's birthday and mine as well (it was last week). It will be nice to have them all under the roof, if only for a day or two. And a pleasant reminder of what is really important. It is time to hit the send button. My friend Jack Harrod has front-row seats on the glass for the Dallas Stars. I don't understand hockey, but it is exciting sitting that close. All the best, and have a great week - and here's hoping for a bounce in the markets.